Identity/Class: Former normal human; now a digital energy entity living on a Compact Disc. Occupation: Former billionaire; now serves as a coaster/paperweight in his sons' law offices. Aliases: Called the "Mind-Slave" on a cover and one interior caption. 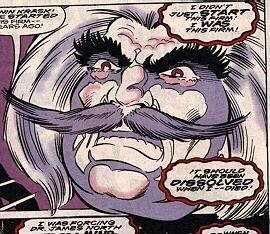 Powers: In his first appearance, Kronin Krask had no powers at all, unless you count his extreme wealth. After his rebirth, he could control all nearby electrical systems. He did this because he had an awareness of what "all the electrons nearby" were doing, and could direct them into large shock bursts and other electrical effects. When he manifests a body now, he possesses a large amount of electrically charged strength. He also can freely enter cyberspace and has some power to manipulate its structure. Weaknesses: Kronin Krask is an egomaniac who thinks the world owes him an immortal life. He is obsessed with living forever, to the point of undergoing dangerous experiments to prolong his life. In his energy form, he is vulnerable to running out of nearby electricity to power his thoughts, and also to overloads of data while in cyberspace. Physical Description: Kronin Krask was an extremely large individual with orange hair and a long moustache. He also had terrible taste in clothing. These days, he manifests himself as a giant floating head of purple electricity, or as an even larger (10 foot tall) purple energy version of his former body. He always keeps the moustache, regardless of how he appears. History: Kronin Krask was a billionaire. He began a very successful law firm and was a decorated if ruthless lawyer, but most of his riches were made on Wall Street. He married an unknown woman, presumably dead or divorced by the time we meet him, and had two sons. In his late 40s, he discovered that he was dying of an incurable illness. I don't know how sane he was before, but this definitely sent him off the deep end. (Thor I#172) - Krask hired a private army to guard his estate, equipping them with the latest high-tech Kirby-esque goodies. He kidnapped Jane Foster (didn't everybody?) to force her employer, Dr. Jim North to perform "certain forbidden experiments". Jim North contacted Dr. Don Blake, and told him to get ahold of Thor. Meanwhile (seriously), Odin had a menacing vision of Kronin Krask killing Thor (Yeah, big fat guys are the Thunder God's secret weakness, I guess). 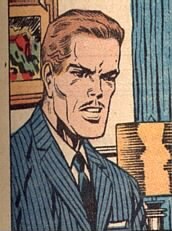 Dr. Jim North went to the estate of Kronin Krask, who ordered him to perform a mind-transplant. Dr. North protested that it was "impossible, except for Dr. Wagnastein". Jim North had once been apprenticed to Dr. Wagnastein, whom Kronin Krask had already captured and made him reveal the secrets of his mind-transplant process. Thor arrived at Kronin Krask's estate, and after dealing with Krask's private army and their "heavy cannon", a strange device arose out of the ground that overcame Thor with a hallucegenic mist. As Dr. North prepared for the operation, he wondered who Krask had convinced to switch bodies with him, since he would receive Krask's old body. He found Krask strapped down and a mysterious figure under a sheet. Krask kept saying things like "If I die - the girl dies. But if I survive, I will live like a god! I will live forever!" Dr. North removed the second sheet to find it was (surprise!) Thor lying there. Krask explained that he counted on the fact that Dr. North would know Jane Foster was once friendly with Thor, and contact him for help. Dr. North refused, but they threatened to kill Jane, and he agreed to proceed with the mind-transplant. 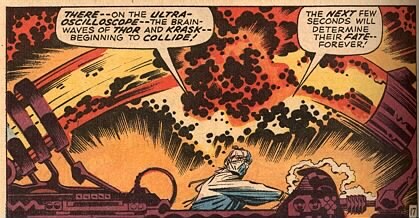 Dr. North placed a small metal plate on Thor's head and Krask's head, hooking them up to a strange looking machine called the "Ultra-Oscilloscope". He activated the machine, and "brain-waves of Thor and Krask begin to collide". Above the machine appeared an energy image of Thor and Krask fighting, their egos clashed and then began to merge. Thor's ego won out, Krask jumped out of the machine, and then fell dead to the floor. Thor was fine. He said he was awake the whole time, but didn't do anything because he thought it was "a challenge no warrior could ignore! Did the vainglorious villain think to triumph over an immortal?" He assured Dr. North and Jane they were blameless in this, and flew off. BTS - The government confiscated much of Krask's estate, including the Ultra-Oscilloscope. Whatever money was left went to his sons as an inheritance. (Marvel Double Feature...Thunderstrike/Code Blue#15) - The warehouse the Ultra-Oscilloscope was stored in had its funding cut, and the device was not properly maintained, thus allowing Krask to at last escape from it. (Marvel Double Feature...Thunderstrike/Code Blue#16/2) - Kevin and Kenneth Krask were suing the city for $50 million on the grounds that Code: Blue was an "insufficient response" to the recent Dr. Doom Robot rampage and the Thermal Man's attack, and that the Avengers or other super-heroes should have been called in to minimize damage. Foggy Nelson came to the offices of Krask and Krask with Lt. Stone (field leader of Code: Blue) for a deposition. Foggy represented the city's insurance company Delmar, and argued their evidence, but to avoid a trial he agreed to a settlement of $12 million, which the Krask brothers rejected. They proceeded with the deposition of Lt. Stone. Daredevil was following Foggy Nelson around to watch over him, and sensed an "emanation of evil" and entered the building. Suddenly, giant electrical sparks started shooting out of the walls, and formed themselves into a giant floating Kronin Krask head. Krask revealed that he had learned to control electrons while in the machine, and took over all electrical systems in the building. He told his sons he wanted to be declared a living energy person. They wanted him to stay dead so they could keep their inheritance. He heard them, and said they must comply, or he would erase Wall Street's computers and collapse the U.S. financial system. 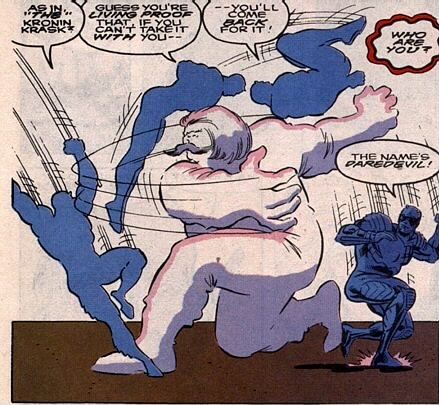 Code: Blue was called in, and Krask manifested an energy body to fight them. They tried to use containment fields (ala Ghostbusters), but they were ineffective. Daredevil showed up and distracted Krask. Code: Blue also had an "energy-matrix disruptor", but Krask knocked it away before they could use it. Daredevil picked it up and flung it at Krask, but he was able to overload it. Krask continued to beat on Code: Blue, and they called in Code: Gray, the city's "super civil servants". Code: Blue, in a rather pathetic gamble, claimed they had managed to "Krask-proof" all the computers in the Krask building while they were fighting him. Krask was like "Sh'yeah, right! ", and dived into a computer to test this out (kinda dumb on his part). Somehow, Code: Gray put on virtual reality helmets and got into cyberspace and found Krask there. Krask was bombarded with "raw financial data, cascading into me like cosmic rays!" Krask fought back, he had a lot of power in cyberspace, but was eventually overwhelmed by the data. When they returned from cyberspace, Code: Gray had Krask's mind and energy form inscribed onto a compact disc. Foggy Nelson and Code: Gray agreed to give Krask back to his sons, but only if they agreed to a mere $500,000 settlement, otherwise they would challenge the Krask brother's inheritance on the grounds that their father was still alive. They gave the disc of him to his sons after they agreed to Foggy's terms. Comments: Created by Stan Lee and Jack Kirby. The Krask sons and Code: Gray created by Roy Thomas, Jean-Marc Lofficier, Larry Alexander, Grant Miehm and Charles Barnett. Thor I#172 is Jane Foster's single appearance between Thor I#136 and Thor I#231. She is shown in Thor I#136 as going to work for Dr. Kincaid, and then is shown here working for Dr. Jim North, and then later (circa Thor I#235) we learn that she has been working for Dr. Keith Kincaid for a long time. 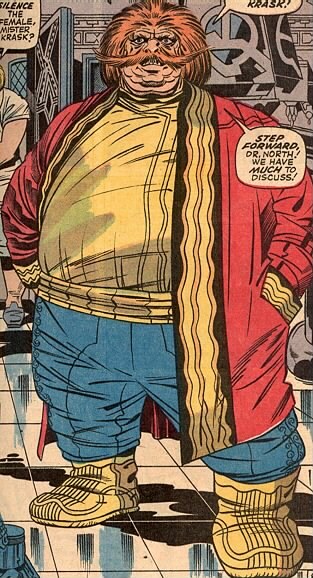 It's pretty obvious that Stan Lee intended Dr. North to be Dr. Kincaid, but got the name wrong. Dr. North, like Dr. Kincaid, loves Jane Foster, she loves him, and he is described as the "doctor she went to work for after she left Dr. Blake" (which is not true unless he is Dr. Kincaid). So if Alan Zelentz had had this issue, and not Thor I#136 handy when he reintroduced Jane's employer (I believe circa Thor I#334), we would have had Jane in love with and married to a Dr. North instead of a Dr. Kincaid, and Kincaid would be the forgotten name. But as it is, we're stuck with two different doctors and Mrs. Jane Foster-Kincaid. Jean-Marc Lofficier revealed that Woodrow Truesmith and Tom Jeffers of Code: Gray were based on the Doc Savage characters Ham and Monk, respectively. Also, the entire cast of Code: Gray was named after characters created by filmmaker Preston Sturges; Woodrow Truesmith is from Hail the Conquering Hero (1944), Charlie Pike is from The Lady Eve (1941), Tom Jeffers is from The Palm Beach Story (1942), and Trudy Kockenlocker is from The Miracle of Morgan's Creek (1944). Profile by caliban, reformatted and slightly updated by Luis Dantas, updated further by Prime Eternal. Ultra-Oscilloscope: A device designed by a Dr. Wagnastein, that allowed two minds to be exchanged permanently in a non-surgical procedure. It directly transfers brainwaves. If the egos of the recipient are too strong, though, the two subjects may have to psychic battle for dominance and the right to move into the body they want. The battle is handily projected as mental energy above the Ultra-Oscilloscope. Also, a mind who loses a battle can be stored inside the machine, and can learn control of electrical devices while stuck disembodied inside it. 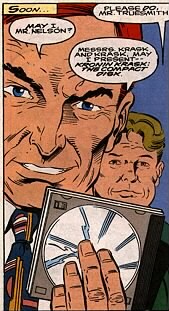 Dr. Wagnastein: Makes no appearance in Marvel Comics to my knowledge, the unseen creator of the Ultra-Oscilloscope. Apparently Kronin Krask kidnapped him and forced him to build the Ultra-Oscilloscope, but he was unable or unwilling to perform the mind-transfer operation. I'm presuming that he was killed by Krask, though this is never made clear. He was the mentor of Dr. Jim North. Kevin and Kenneth Krask: After the death of their father, Kenneth and Kevin Krask took over their father's law firm, and specialized in class-action lawsuits against the City of New York for miscellaneous super-hero damages to their numerous clients' homes and businesses. Sleazy as all get out, they were interested in getting the most possible money and the biggest fees from the city at every possible circumstance, not really caring about their clients at all. They appear to be in their mid-thirties, and apparently did not receive all of their father's wealth, much of which may have been confiscated by the government. (Mighty Avengers II#7 - BTS) - Cortex Inc. became employers of the Krask Brothers, who helped get Gideon Mace declared sane and out of the psych ward. (Mighty Avengers II#7) - Kenneth took the case to get small-time extremist Kenny Driscoll, one of Mace's men, out of prison when he was arrested for arson. 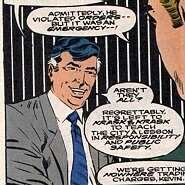 As soon as Driscoll was out Kenneth left him for the Mighty Avengers to catch again. Kenneth's brother Kevin was later present at the American Policy Research Initiative's HQ in Hell's Kitchen when the Mighty Avengers protected Mace from White Tiger, whose family had been killed years ago by Mace. While Spectrum posed as Mace, using her light-bending powers, Kenneth was upstairs with the real Mace. They were impressed at the fast arrival by the police after White Tiger's attack. Kenneth also revealed that Kenny Driscoll had been taken care of by Cortex Inc. (he was killed). (Mighty Avengers II#8 - BTS) - The Krask Brothers acted as Mace's lawyers against White Tiger, while She-Hulk was going to defend her. She-Hulk considered the Krask Brothers no light-weights in the court. Code: Gray: Four civil servants, each experts in various branches of city administration, they assisted Code: Blue this one and only time. Presumably, they still work for the city. 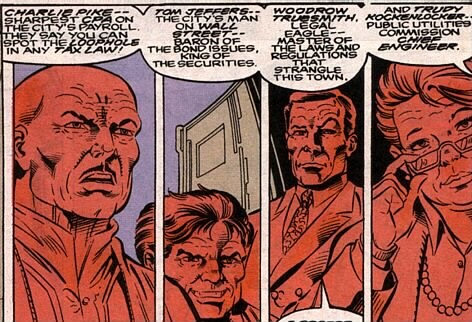 From the captions, left to right: Charlie Pike ("sharpest CPA [Certified Public Accountant] on the city's payroll"), Tom Jeffers ("the city's man on Wall Street - Baron of the bond issues, King of the securities"), Woodrow Truesmith ("legal eagle - master of the laws and regulations that strangle this town"), Trudy Kockenlocker ("public utilities commision Chief Engineer").